Book Jacket: "1985. After the death of her beloved twin brother, Felix, and the breakup with her longtime lover, Nathan, Greta Wells embarks on a radical psychiatric treatment to alleviate her suffocating depression. But the treatment has unexpected effects, and Greta finds herself transported to the lives she might have had if she'd been born in different eras. During the course of her treatment, Greta cycles between her own time and alternate lives in 1918, where she is a bohemian adulteress, and 1941, which transforms her into a devoted mother and wife. Separated by time and social mores, Greta's three lives are remarkably similar, fraught with familiar tensions and difficult choices. Each reality has its own losses, its own rewards, and each extracts a different price. And the modern Greta learns that her alternate selves are unpredictable, driven by their own desires and needs. As her final treatment looms, questions arise: What will happen once each Greta learns how to remain in one of the other worlds? Who will choose to stay in which life? 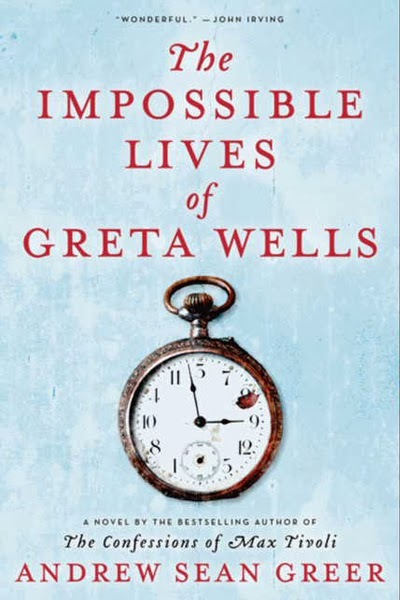 Magically atmospheric, achingly romantic, The Impossible Lives of Greta Wells beautifully imagines 'what if' and wondrously wrestles with the impossibility of what could be." Taryn's Review: I recently moved to a new city and one task on my to-do list was to get a library card immediately. Due to a string of requirements that I had to do before getting a library card, it took me longer than I expected to get to the library. Due to a fluster of errands and mishaps that had befallen on me that day, I was a bit distracted when I finally walked into the library to get my card and I quickly realized I had no idea what books I wanted to check out. I was feeling harried from a long day, so I honestly just grabbed a book off the shelf without thinking too much about it. Once home, I realized the book involved time travel and I was very pleased with my random selection since I enjoy a good time traveling book! I read this book over a few weeks since I was busy adjusting to my new city. It's hard for me to say if it was due to my slow reading of the book or because of the way the book was written, but the story was really difficult for me to follow. I would get confused while reading chapters and have to go back and double check which of Greta's lives I was reading about. One of my biggest frustrations about the book was Greta's pushing of her 1918 and 1941 brother Felix to openly love the man he had loved in 1985. I'm not saying that I don't want people to love the person they do, but, sadly, the risks of being a homosexual during those eras were huge and sometimes tragic. Greta seemed incredibly ignorant to these facts and just kept trying to set up her brother with the man he would love/loved. It was in these moments that her character came across as being very one-dimensional to me. Felix understood the social mores, and although he was denying his true self, he didn't have much a choice, unfortunately. I think it would have a been a great inclusion for the story to really highlight the struggles someone like Felix would have faced in 1918 and 1941(even if from Greta's viewpoint), but it just felt like background noise to Greta's quest for happiness. The ending felt a bit clunky and I had to go back and read it a few times to understand exactly what happened for the Gretas. The author was big into foreshadowing and overplayed some themes, but those issues weren't enough to deter me from reading another book of his. Ultimately, while I loved the idea the book offered, it ended up being a so-so story for me.